Zero inflation and over-dispersion issues can significantly affect the predicted probabilities as well as lead to unreliable estimations in count data models. This paper investigates whether considering this issue for German Socioeconomic Panel (1984-1995), used by Riphahn et al (2003), provides any evidence of misspecification in their estimated models for the adverse selection and moral hazard effects. The paper has the following contributions: first, it shows that estimated parameters for adverse selection and moral hazard effects are sensitive to the model choice; second, the random effects panel data as well as standard pooled data models do not provide reliable estimates for health care demand (doctor visits); third, it shows that by appropriately accounting for zero inflation and over-dispersion there is no evidence of adverse selection behaviour and that moral hazard plays a positive and significant role for the number of doctor visits. These results are robust for both males and females’ subsamples as well as for the full data sample. Kavand, H. (Hossein), & Voia, M.-C. (2017). 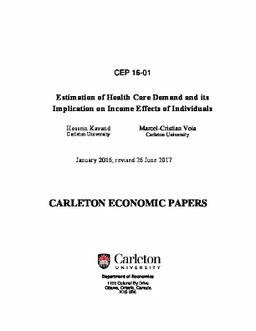 Estimation of Health Care Demand and its Implication on Income Effects of Individuals (No. CEP 16-01). Carleton Economic Papers (CEP). Department of Economics.